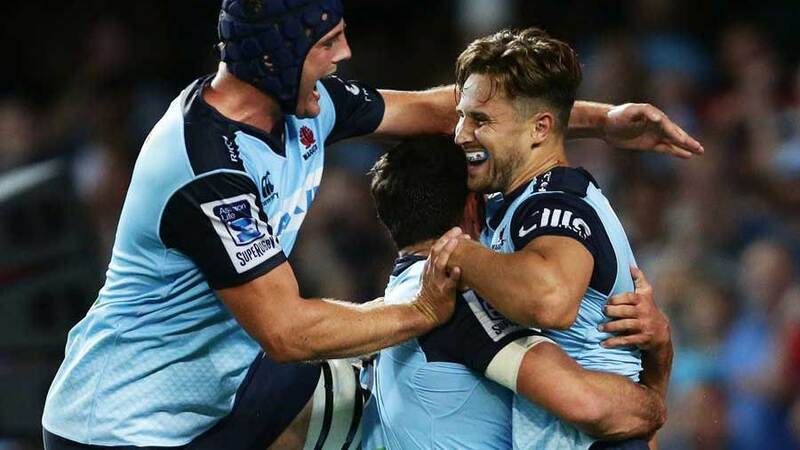 Daryl Gibson made a winning start to his career as New South Wales Waratahs head coach after assuming the top job from Michael Cheika, but he will have been a little disappointed his side failed to go on with the job after leading their unstriuctured tivals 20-0 at half-time. The Waratahs' new playmaking duo of five-eighth Kurtley Beale and David Horwitz were particularly prominent in the first half, and tries from captain and openside flanker Michael Hooper, winger Matt Carraro and the rookier inside centre set up the buffer for the home team as they went to the sheds, but the hosts lost some lustre as Queensland's pack fought hard to earn a foothold in the second stanza. The Reds created some try-scoring opportunities in the first half only to be denied by strong Waratahs defence, but they showed more fight against a less-impressive Waratahs outfit after the break, scoring 10 unanswered points in the third quarter, and five-eighth Jake McIntyre dummied his way over for the visitors' only try just before the hour. Needing to get three tries ahead of the Reds to earn a bonus point, the Tahs crossed for their fourth five-pointer when impressive half-back Nick Phipps won the chase to a Beale kick in the 62nd minute. Hooper said the Reds "threw a lot at us, particularly in the second half". "We were comfortably in control of them in the first half but then some really good one-on-ones from them in the second half caught us off guard and we had to get back in the game." Reds captain Rob Simmons lamented ill-discipline that saw them concede conceding four penalties in the first eight minutes and had a man sin-binned in each half. Referee Angus Gardner warned Simmons in the eighth minute, after his team had conceded those first four penalties, that the Reds risked having someone sent to the bin if they didn't clean up their act. Simmons didn't heed the warning as he was sin-binned five minutes later. "Twenty minutes with 14 men, that's not easy," Simmons said. Gardner also delivered a stern lecture to both front-rows just before half-time, and he sin-binned two reserve props, the Reds' Sam Talaki and the Waratahs' Jeremy Tilse, in the second half. An injury to centre and Reds debutant Henry Taefu meant Japanese World Cup star back Ayumu Goromaru was on after just 27 minutes, a bonus for the large Japanese media contingent attending the game. Goromaru scored the Reds' first points from a 37-metre penalty in the 45th minute, missed with another attempt from slightly further out a few minutes later, but converted McIntyre's try.